When visiting New York City, the Brooklyn Bridge and lower Manhattan are a must-see! Riding a bike makes it quicker and easier to independently sight-see NYC attractions! Brooklyn has approximately 5 miles of waterfront scenic bike paths starting at Brooklyn Bridge Park. Manhattan is now almost completely circled by waterfront bike paths and protected lanes throughout NYC! Choose from flexible time options ranging from 1-hour to all day! Renting a bike and independently exploring New York City and Brooklyn is a low-cost, practical and memorable favorite activity and fun for all ages! Choose from top-quality bicycle rentals close to the Brooklyn Bridge. Explore lower Manhattan and ride over the Brooklyn Bridge - one of the oldest bridges in America and a National Historical Landmark. 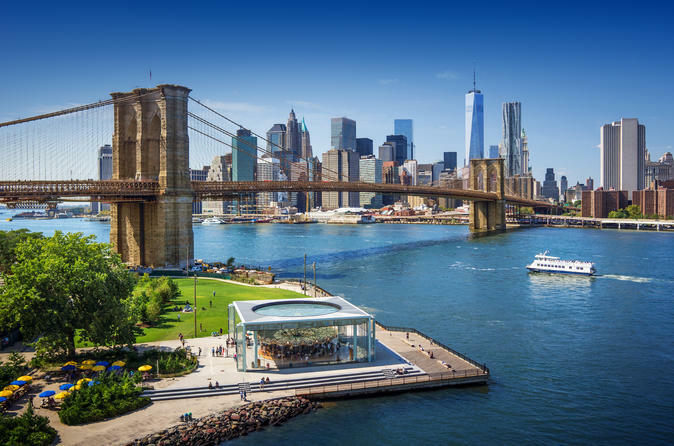 Visit iconic Brooklyn Bridge Park, Brooklyn Bridge Park, the Brooklyn Greenway and waterfront, Jane’s Carousel, DUMBO, other popular parts of trendy Brooklyn - and even some attractions of Lower Manhattan with this amazing bike rental! Tandem bike (two people) may be provided if available (although not guaranteed and are counted as two bicycles). Road bikes, child bike trailers, and child seats may also available at additional cost. You may also rent a bike from this location and drop it off at another location (inquire at the shop for more info). Bike rental and bikes appropriate for all ages and skill levels, and one adult 18 or over must be present and responsible. Bicycle included and bike helmet available on request, mandatory for children under 14.